This waterfall is easy to miss. 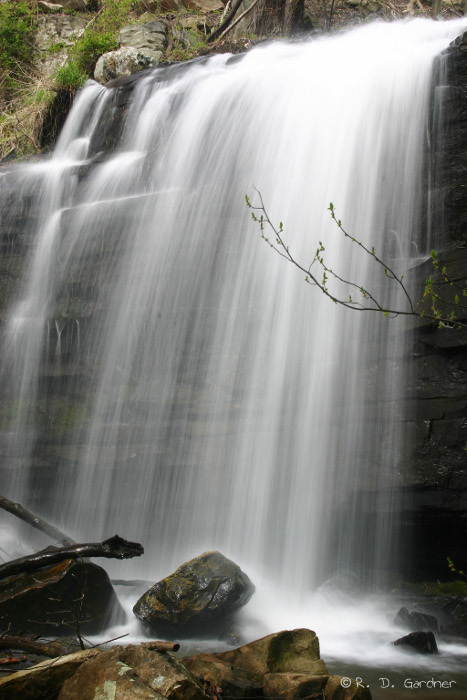 I visited Bays Mountain Park 2 or 3 times before noticing the waterfall. While the volume of flow is low at times such as the picture above, Dolan Branch will have a respectable amount of flow during the winter and spring months. In fact, the difference in seasonal flow makes a huge impact on the appearance of this particular waterfall as you can clearly see to the left. Although not particularly spectacular, it is a nice, little waterfall that's just a short walk from the parking lot of Bays Mountain Park. 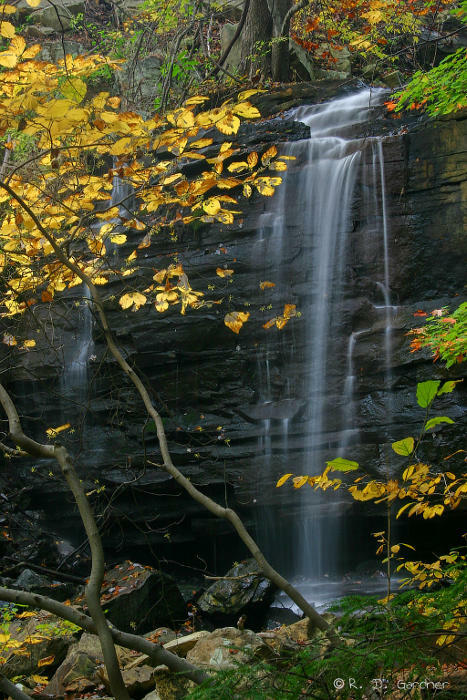 Bays Mountain Park is located just to the west of Kingsport, TN. Good directions can be obtained from their website at http://www.baysmountain.com. Dolan Branch Falls is located just below the dam on the opposite side of the road as your enter the park. There is no hike, just a short walk from the parking lot. Your primary problem here is in the composition. The park road is just above the waterfall. There is also a culvert opening that can get in your pictures if you aren't careful. Regardless, there are many good angles from the hillside to the right of the falls. Try framing with trees and rocks in the vertical format. I've been fortunate to visit on cloudy days. Because of the close road access, the falls are fairly open. Since they face southeast, later afternoon should be your best bet for good pictures. A polarizing filter will always help but I don't consider it a must for this waterfall. And as always, a tripod is a must. I'm just starting to work with digital video. Here is my first one. I've decided to avoid the popular Youtube site until their video quality improves. They compress the whiz out of any uploaded video, and waterfall videos really seem to suffer greatly from it. from Randy Gardner on Vimeo.